Two of the most popular lives of St. Cadoc were written 500 years after his repose and contain both authentic and inauthentic information. St. Cadoc was the elder son of king Gundleus (or Woolos, “the warrior”) and Queen Gwladys (Gladys; both of them later became hermits and were venerated as saints after their repose) and he was born in Monmouthshire. St. Petroc of Cornwall was a relative, and the priest and hermit Tathyw (Tathan) baptized him and instructed him in the monastic life. It was said that Cadoc had worked miracles even before his death: heavenly light miraculously appeared in his parents’ home and even food was multiplied (hence he is a patron of those suffering from famine). The future saint refused to claim the throne and decided to serve God all his life. He preached very zealously in Wales and later founded Llancarfan monastery, becoming its first abbot. He is rightly considered to be one of the founding fathers of monasticism in south Wales. The name "Llancarfan" from Welsh means "a deer church." Tradition tells us that two tame deer, harnessed to a carriage, helped St. Cadoc build the monastery. Some early sources say that about 1,000 monks lived in the Llancarfan Monastery at the same time. Llancarfan also had several small daughter monasteries and cells (sketes). St. Cadoc also established a seminary in his monastery which was to produce many holy men. The soil of this part of south Wales, before the arrival of St. Cadoc, was very marshy and barren. The saint and his disciples drained the marshes and cultivated the land so energetically that it soon became fertile land. Thanks to the unbelievable labors of the ascetic Cadoc and his monks, which took many years, this formerly uninhabitable region turned into one of the most beautiful and prosperous corners of south Wales. Apart from the church, the monastic buildings and the seminary, the monastery also had its own hospital. 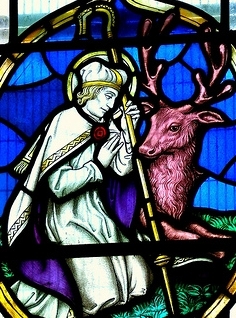 St. Cadoc with the deer. 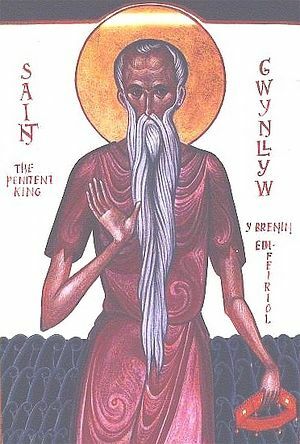 According to tradition, the future St. Iltut, who later was to found another great monastic centre at Llantwit-Major, began his monastic life at Llancarfan under St. Cadoc. At the invitation of St. Cadoc, Gildas the Wise once came to this monastery. St. Gildas remained there for a year, taught in the seminary and even compiled a copy of the Gospels, which was kept in the monastery church for a long time. The Welsh people loved this Gospel so much that they used to take oaths on it. Llancarfan Monastery was also noted for the tradition of serving the needy. Once a band of robbers was approaching the community. 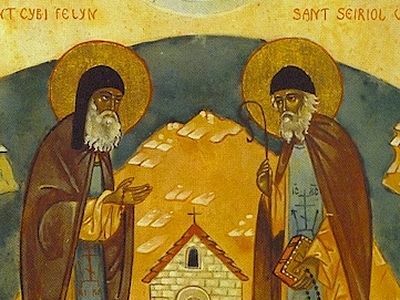 St. Cadoc with his brother monks, relying on God, went out singing church hymns in very loud voices: the robbers were immediately ashamed and turned back. It is also recorded that St. Cadoc lived as a hermit on the island of Flatholm in the Bristol Channel, while his friend, St. Gildas, lived as a hermit on another small island nearby, called Steepholm, which is now in Somerset. The friends and hermits met from time to time to pray together. 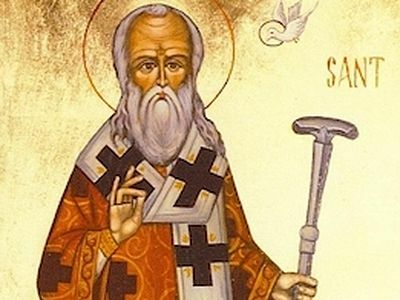 During his life St. Cadoc studied for some time in Ireland and visited many Irish monasteries, and in about the year 562 he probably made a pilgrimage to the Holy Land and Rome. From Jerusalem he brought back to his monastery several altar stones which had touched the Holy Sepulcher. Later St. Cadoc (perhaps together with St. Gildas) led a solitary life on an island off the coast of Brittany, not far from Vannes. It should be mentioned that a great many Welsh and Cornish saints moved to live in and evangelize Brittany while a considerable number of Bretons came to lead the ascetic life in Wales. These two lands were very closely linked spiritually. In Brittany St. Cadoc was a very active missionary, and there he may have founded a chapel and a monastery. Some sources say that in his later years, Cadoc was too old to rule his Llancarfan Monastery and so he retired to a certain secluded place, probably near Abergavenny. According to tradition, St. Cadoc was slain by a pagan in the town of Weedon (originally Beneventum in Northamptonshire) in England while serving the Liturgy. (This tradition is supported by the fact that at that time pagan Saxons and Angles were actively invading parts of Britain and the saint went to England to support persecuted Christians). However, some historians believe that the saint was not martyred and died a natural death. Some researchers suppose that St. Cadoc was also a bishop, but there is no strong evidence to support this. 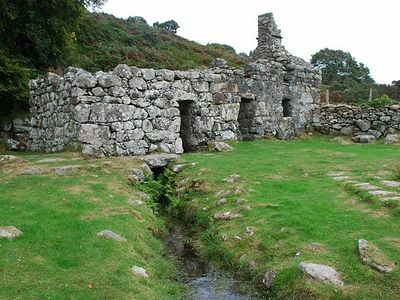 Among other monasteries possibly founded by St. Cadoc, we can mention the monastery of Brecknock, as well as numerous chapels, churches and monasteries in Dyfed (present-day Pembrokeshire, Carmarthenshire, and Ceredigion), Cornwall, Brittany and Scotland. It is said that the saint constructed a stone monastery in the Scottish region of Stirlingshire, in a place called Kilmadock. Cadoc allegedly lived here for seven years and seven churches in the area were dedicated to him. Opponents of this story state that the monastery of St. Cadoc was situated in another place—in the present-day St Ninians near Stirling. The saint was a close friend of St. Gildas and probably communicated with St. David, the patron-saint of Wales. Among his disciples there were St. Barrog as well as St. Finnian of Clonard, one of the greatest Irish saints (owing to St. Finnian, St. Cadoc became well-known in Ireland). According to evidence from that time, St. Cadoc was famous for his outstanding intellect and so he was called "Cadoc the Wise" by his contemporaries. Later there even appeared collections of his sayings. St. Cadoc is usually depicted with a lance and with a crown near his feet, sometimes with a deer, mouse or pig. (All of these animals helped the saint in his life. A mouse during the famine showed the monastery’s brethren an abandoned and very rich granary, and a sow pointed out to the saint the spot where he was to build his monastery). 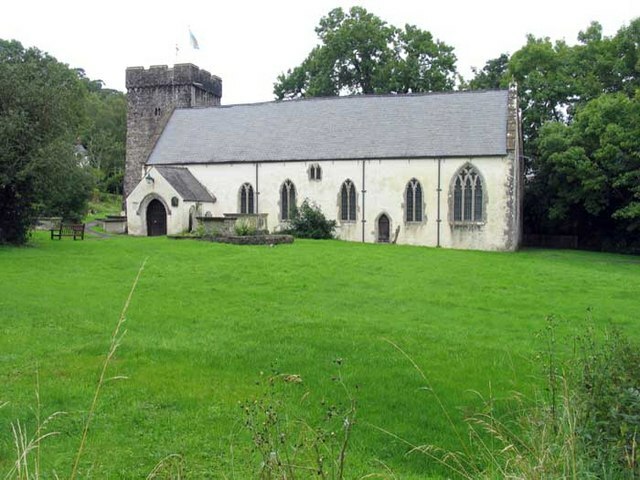 Church of St. Cadoc in Llancarfan, Wales, the site of his monastery. At least fifteen churches are dedicated to St. Cadoc in Wales, especially in the south of the country and also in Brittany. A chapel in Cornwall is dedicated to him as well. 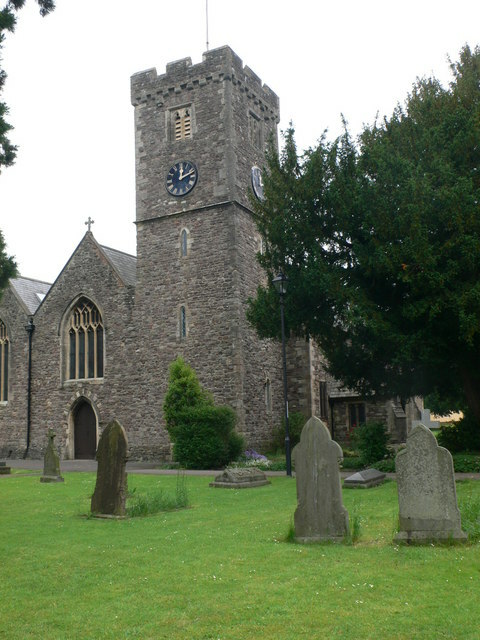 Disciples and spiritual children of Cadoc continued his labors in South Wales and built many churches and chapels in his memory, particularly in Glamorgan and Gwent. The monastery of Llancarfan, founded by the saint, existed till 1086 when it was dissolved after the Norman Conquest. 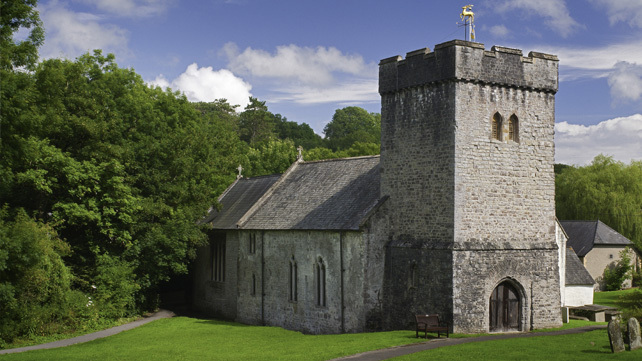 In the present-day village of Llancarfan (situated 15 miles from Cardiff and just near the town of Cowbridge), where this monastery was located, there is still a large, beautiful and ancient church, dedicated to St. Cadoc. It is visited by pilgrims to this day. Several years ago during conservation work inside this church, fine and bright fifteenth century wall-paintings, depicting the life and miracles of St. George, the royal family members, the seven deadly sins, and so on were uncovered under a layer of limewash on one of its walls. A Norman church in the Welsh town of Caerleon is dedicated to him; apparently the saint visited this place or lived the ascetic life here for some while. A local hospital bears the saint's name as well. The name of St. Cadoc is invoked against deafness, especially by the faithful in the department of Finisterre in Brittany. No less than thirty places in Brittany (including even an isle called L’Ile de St. Cado) are named after St. Cadoc. In ancient time his name was also evoked against scrofula and cramps. And now let us say a few words about the parents of St. Cadoc—Gundleus and Gwladys (both reposed in the first half of the sixth century and are commemorated on March 29/April 11). St. Gwladys was one of numerous children of the famous saintly King Brychan of Brecknock, and in her youth was very beautiful. She married Gundleus, then a ferocious pagan, who was a minor king in south-east Wales. They had several sons, the greatest of whom was St. Cadoc. Under the influence of his pious Christian wife and his glorious son Cadoc the king subsequently repented of all his past sins and became a devout Christian. In a miraculous vision Gundleus was soon told to found a hermitage together with his spouse on Stow Hill near Newport in South Wales (now within the city of Newport). Thus, this devout royal couple began to lead austere ascetic life. Already at an advanced age, they lived in such abstinence that they ate nothing but bread and herbs, drank nothing but water and prayed even on winter nights in the River Usk (which was a common practice among Celtic saints). They attended church every day, kneeling in prayer before the holy altar. But the holy couple did not stop at this. On St. Cadoc’s advice they abstained from marital relations and lived separately in solitude and unceasing prayer till the end of their lives. St. Gwladys then moved to the spot called pencanau in Bassaleg near Newport where she lived an extremely austere life in her cell, standing every day in the river Ebbw in prayer. Shortly before her death she moved to Gelligaer in Caerphilly where she probably reposed. Many sites near Newport and Gelligaer were connected with her and a number of churches, chapels and holy wells were dedicated to this saint. Today Gwladys is the patroness of both Newport and Gelligaer, though she is especially venerated in the town of Bargoed in Caerphilly, where a church is dedicated to her and a school bears her name. Girls in Wales and throughout Britain used to be called “Gladys.” As for Gundleus, up to his death he wore rags, ate barley bread and drank a little water, and combined prayer with manual labor. On his deathbed he was visited by St. Cadoc who gave him communion. Today he is co-patron of Newport together with his wife Gwladys; the local Anglican cathedral in this city is dedicated to him and a street bears his name. This is a remarkable example of family holiness in ancient Britain. 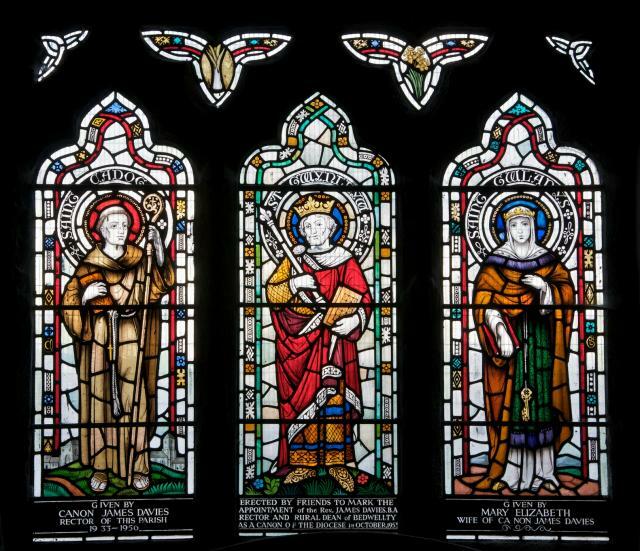 Holy Father Cadoc and his Holy Parents Gundleus and Gwladys, pray to God for us! This discovery is considered to be one of the best and rarest tableaux of the Great-Martyr George the Victory-Bearer, Patron-Saint of England, in Britain. Interestingly, similar cases of the discovery of medieval wall-paintings beneath whitewash occur regularly. The fact is that the medieval churches of Britain were very richly and beautifully decorated inside, but Protestants, especially the Puritans in the seventeenth century, deliberately whitewashed the walls of churches in order to hide the paintings, which were against their religion. However, this did not destroy the precious frescoes but, on the contrary, helped them survive. The Lord made Wales a hilly land facing the prevailing Atlantic winds, thus blessing it with abundant rain and fresh waters. Our country is equally saturated with a rich inheritance of Christian belief and practice, so one should not be surprised to learn that holy wells are numerous and prominent features of the geographical and spiritual landscape. Even a strict definition of the term “holy well” allows there to be several hundred here, and diligent research is bringing even more to light once dismissed as objects of superstition, they are now the subject of increasing interest.